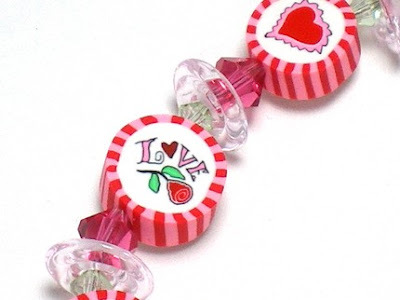 I just brought back the "Love You in Pinstripes" bracelet that features handcrafted pinstriped beads in polymer clay using the "cane" technique. These "pictures" are not painted! They are incorporated into a tube of clay (called cane) that is rolled smaller and smaller to the desired diameter and then sliced to expose the "pictures" on BOTH sides of the beads. 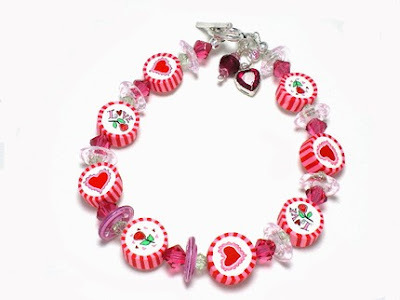 This bracelet has luxurious glass & crystal "danglies" to enrich the red and pink tones of the clay. The bracelet will fit wrists that measure up to 5 3/4 inches. Free shipping on this one!!! See more details in my SHOP. Be sure to visit my paper shop to get your custom Valentine & Spring sticker needs fulfilled. This is so much fun! 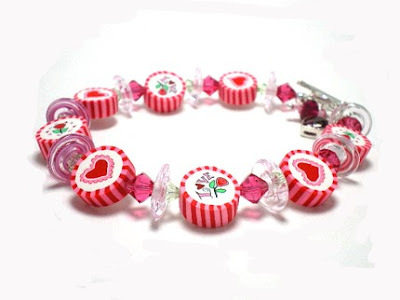 It would be great for Valentines or even during the Summertime! 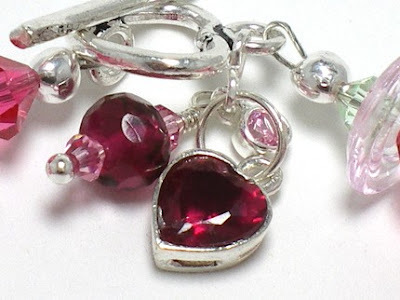 Thanks so much for visiting me at Loveleigh Treasures and joining in my giveaway, it was a pleasure to meet you and I hope you have a terrific day!